As part of Science Week at Lings, Year 1 have been learning all about plastic and recycling, in line with our Materials topic this term. We have been on a plastic discovery walk around the school, we had a Waste Education talk and we have read a story and completed some work on a book called ‘Michael Recycle’. The children had to create their own green superhero and tell us what powers they would have to help save the world by making people recycle! We had some very creative ideas … from waterzapping hands to zap rubbish before it falls to the floor … to superspeed flying to catch the rubbish and put it in the bin! We even thought about their costumes and how they could reuse materials to make their suits and capes! In singing assembly, we learnt about sound and how sound travels into our ears. Miss Battams taught us Makaton for Robbie Williams, ‘Angels’. Friday afternoon, the teachers had a mix-up and went to teach in different year groups. Mrs Tucker and Mrs Whitestone came up from Reception to lead a session with the Year 1 children. The children had to see how many drops of water they could fit onto a coin. They made predictions and then carried out their test to see how close they were to their estimate. They also did an investigation with skittles and added water/milk to see what happened … ask them what they discovered! 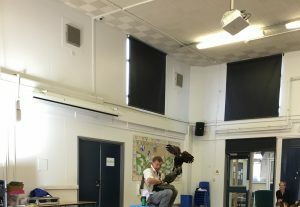 Who could forget about our Birds of Prey visit to the school! 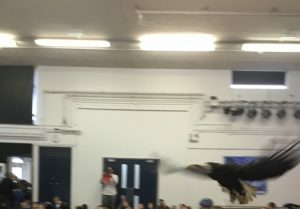 Just look at how big they were … and flying INSIDE the school! Our group reading this week was our non-fiction information sheets about plastic and recycling, please share these and read them with your children. I had a wonderful time in Year 1 this afternoon. The children made some great predictions! Thanks for having me. It sounds like you’ve had a great week and learnt so much. Elliot has been telling all his family and friends about the importance of recycling and reusing waste where we can.